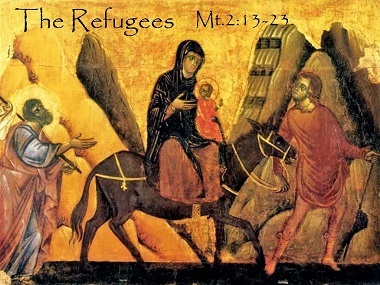 The holy family was forced to seek refuge in Egypt. Aaron White has written a Daily Advent Prayer Guide that connects the ancient nativity story with the realities of displaced people today. Each week during Advent (December 2 – 24) I will post the daily guides; this week I have posted the first four days, Sunday, December 2 – Wednesday, December 5. Jesus is in the caravan. We have heard a lot about this Central American migrant caravan recently. Well, some call it a caravan. Others call it a criminal mob, or an invading army. Some are using the few thousand men, women and children fleeing violence in Honduras and Guatemala together as political leverage, either to inflame fears against foreigners and refugees or to provoke anger against political foes. The attention this caravan has been getting is suspicious, however. It is not the first Central American migrant caravan, and likely will not be the last, but its timing coincided with the American mid-term elections. Once those elections were over there was much less media coverage of the caravan – until the last few days when the first people got to the border and experienced what appears to be intentional delaying tactics from the government. And this is part of the problem. We pay attention when things are sensationalized or politicized, and then our attention moves on to other things. But the people in the caravan are not political leverage or media fodder. Their story hasn’t ended. Neither have the stories of the millions of internally displaced persons, refugees and asylum seekers all around the world who haven’t been highlighted in the news recently. They are, all of them, beloved children of God, made in his image, intimately known. And Jesus is travelling with them. Advent is a time in the Christian calendar when we remember the incarnation of Jesus and prepare for his return. The story of Jesus’ birth – well-worn through nativity plays, Christmas carols and seasonal television specials – seems overly familiar. But perhaps the actual biblical story is less familiar to us than we think. If we celebrate the forced journey of Jesus’ family from Nazareth to Bethlehem; sing about mysterious wise men from the East causing political unrest in Jerusalem; and read about the violent policy that forced the holy family to escape to another land – but fail to see how this might connect to the 68.5 million displaced people in our world today – then perhaps we really haven’t understood the story as well as we should. Jesus became the ultimate sojourner, taking on human flesh not in comfort and security but under threat and displacement. If we can believe that Jesus is present in our worship services and around our family tables, then we must be able to imagine Jesus on the road with people who have lost everything, a situation Jesus and his family knew first-hand. Mary and Joseph sought shelter when they arrived in Bethlehem for the birth. People from all over the world are still looking for shelter and welcome as they arrive in our communities at increasing rates. There are things we can do to receive them well. The first step is to get well-informed. Click on link for a full view of the map. Go to IAFR Canada for information on the refugee situation in Canada, and ways that you can offer welcome to people whom Jesus knows and loves. Pray: Pray for all the millions of displaced people who are on the move throughout our world today. 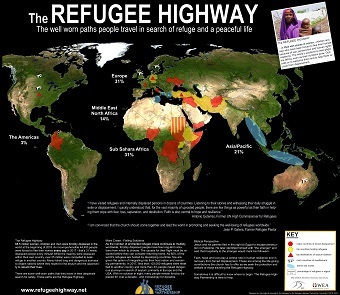 Pray that as they walk the Refugee Highway they would know the presence of God alongside them. Affirm that Jesus is present there, in every single place where there is darkness, where there is hopelessness, where there is fear, where there is violence or threat. And ask the Lord to stir your heart this Advent season to remember those who are walking in darkness. Be silent and consider that number. How does it compare to the size of your church? Your city? Your country? The population of the world? 68.5 million is a shockingly large number of people who are not safe in their homes all around the world. Set against the number of people we meet in our daily interactions this number is overwhelming. Caesar caused the known world to get up and move in order to tax them. But he could not know that in so doing he was helping fulfill a prophecy that the Messiah would be born in Bethlehem. Mary and Joseph were just two of many people forced to travel by this decree, but they were of eternal significance. They weren’t lost in the “mob.” They mattered. So it is with every single one of the 68.5 million displaced people in our world. So it is with you, too. God knows every single one of us by name and circumstance, and he loves us. We are not faceless to him. And each of us is more significant to him than the whims of Empire that continue to cause displacement. Prayer: Find a news source talking about refugees, and search for the name of an individual or family mentioned in the story. Pray specifically for that one person or family today, that they would be brought to safety and know the love of God. Continue to pray for them for the rest of the Advent season. Be silent for a moment and consider: have you ever been faced with a situation that felt entirely beyond your capacities, and that didn’t look like it was going to get better any time soon? How did it feel? What did you do? The crisis of people being displaced due to war, terror or economics is not a new one, nor is it going away. Millions of people left their homes in fear in the past year, and millions more will almost certainly have to do so next year as well. As aid agencies and host nations try to help settle and stabilize the displaced people who are already on the move, they are under the pressure of knowing that more people are soon on their way. In John 1 we are introduced to the God who moves towards us. “In the beginning was the Word,” that is, God’s self-revelation. This Word of God becomes flesh and moves into the neighbourhood. Jesus is willingly displaced from heaven and comes to his creation, not out of fear, but because of love. When we are faced with situations that appear beyond our resources, that have no end in sight and that look to only get more difficult before they get better (if they ever get better), remember this: God is on the move, too. He is on our side. He loves us. Prayer: Ask the Lord how you could best welcome a newcomer – be they internally displaced, a refugee or an asylum seeker, into your neighbourhood in the next year. Then ask the same question to a local agency that is helping to settle newcomers in your city. Be silent for a moment and consider: have you ever been in a situation where you knew everything was likely to change in a moment, but you had little to no control over when or how it would happen? How did you feel? It is very easy to take safety and stability for granted when we have it. But those who have lived through war, terror, deep poverty, displacement, or family or community break-down know the fear and uncertainty of everything being thrown into chaos in a moment. There are millions of people around the world living with the knowledge that any day, any minute, they might have to gather their family, grab what they can and leave behind everything they know. Women in late-stage pregnancy often hear and repeat the phrase: “Any day now!” And when the time for labour comes, it comes, and there is no stopping it. From that moment on everything changes in the short-term and long-term. It is normally a joyous occasion, but it is also fraught with uncertainty, fear and pain. It is a marvel that the Author of Creation entered the world through such a normal, yet frightening and dangerous, process as childbirth. Think of it: Mary’s water broke, she started getting contractions, the child she had been awaiting for nine months – and that Creation had been anticipating for much longer – was suddenly on his way, and everything was about to change. Jesus’ birth was at the same time the most commonly experienced thing amongst all humans, and the most unique thing to ever happen. Each of the 44,400 people who were uprooted in 2017 experienced something both increasingly common and entirely unique. They may have been waiting anxiously for it to happen, may have planned their exit for months, or it may have come upon them with the suddenness of labour pains. But their lives changed in that moment. Prayer: Sit in silence for a minute. Reflect on the fact that 31 people are newly uprooted every minute. Consider what such an “uprooting” would look like in your life. Pray that uprooted people would know the comfort of Jesus in their transitions. Pray that your faith would be strengthened to carry you through life’s transitions, and to be a help to others who have been newly uprooted. Aaron White is on the leadership team of 24-7 Prayer Canada and lives in the Downtown Eastside of Vancouver. Go to the Facebook page for regular updates. Next Wednesday night I will post another week of Aaron’s daily Advent prayer guides, from December 6 – 12..